Interesting first split featuring two unreleased songs for each of the 4 bands unavailable anywhere else. The inner artwork is undeniably minimalist, whereas the rest employs cemeterial and haunted images in line with the title. 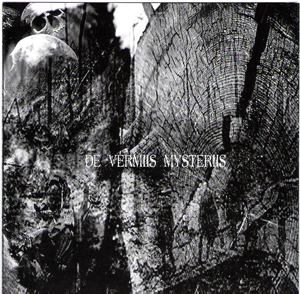 After two full-lengths, we can observe the development of North Italian blacksters Sigma Draconis (owners of the same label that released this disk); the brutal and the groovy go hand in hand during "Mortifero Vulnere Ictus", although the vocals are diabolically distorted, but don't think they've somehow weakened, as the main break will smash your spine to let you rot with an unusual finalé in the sign of War Black metal. "The Shadow of the Winged God" is based upon twisted riffs and odd times, followed by inevitable blastbeats; it's a rather original song with countless shades but unmerciful from beginning to end; to re-inforce this policy Valpurgis utilizes possessed vocals and a refrain which is distinctly bonded by the rebel angel. The end is as majestic as it's menacing. The register doesn't change too much with Roman Black horde the True Endless, playing a scorching style almost always tight in "The Hate of the Mysanthrope pt. I"; this track has a mid-tempo break which is closer to Death metal rather than the Norwegian school, but besides this know you won't have further deviations from the norm. The recording is even dustier than Sigma Draconis's, and it reveals itself particuraly suitable to "Haunting the Christians", a more atmospherical composition if compared to the previous one, which doesn't hide the vigorous bass beats, though. The more popular act of the four here presented, Blodulv, are the only ones from Sweden; their offering consists of two long and all in all simple tracks, led by apocalyptical vocals and guitars playing and sounding like Destroyer 666. The drums are definitely in the background in favour of the voice and the guitars; the result is quite violent but the drumwork is too repetitive and weary in "The Searing Spite", on the other hand the 9-minute "Six Talon Judas" is enough elaborated and involving, drumming included. The only Death metal act are Malignance, presenting two raw and fast whippings; only the screams and few demonic vocals may connect them with the other actors, but mostly they deal with Death and primitive Thrash; "Beyond the Astral Path" contains a not excellent guitar solo and the following "Agarthi Falls" is listenable, yet they need to improve their arrangements if they want to stand out from the average genre colleagues. Waiting for the four's new albums, we can rejoice by tasting the new paths they are taking at an honest price. The edition is relatively limited, so if you don't wanna risk learning a re-print is not in the works you'd better hurry up, even if you're not that much of an experienced listener of extreme music. This is already a cult release!